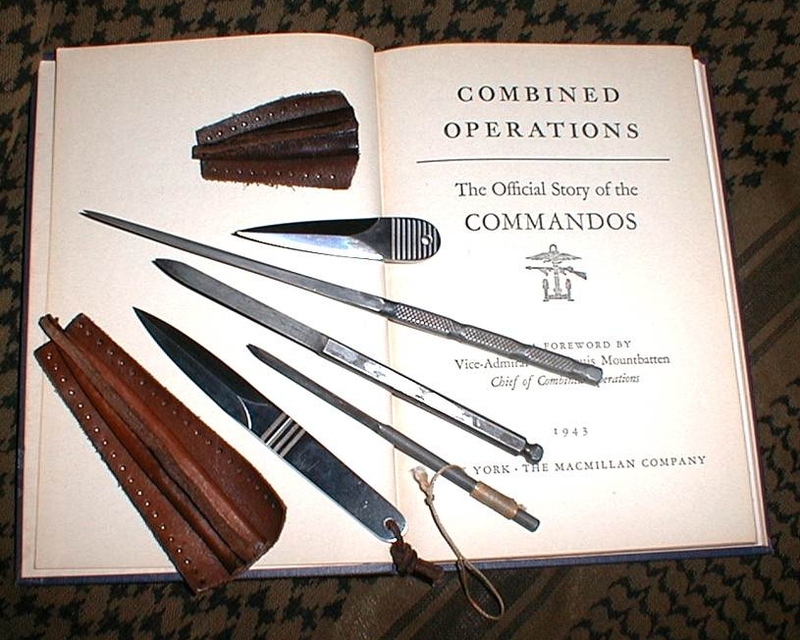 Note: check the pages on Agent's Daggers, Thumb Daggers, and Peter Mason for more photos of WW-II clandestine weapons used by members of the OSS and SOE. Below: Here is a photo of the two USMC Raider knives I bought from the advertisement on the home page. They are terrific fighting knives and attractive additions to my collection. 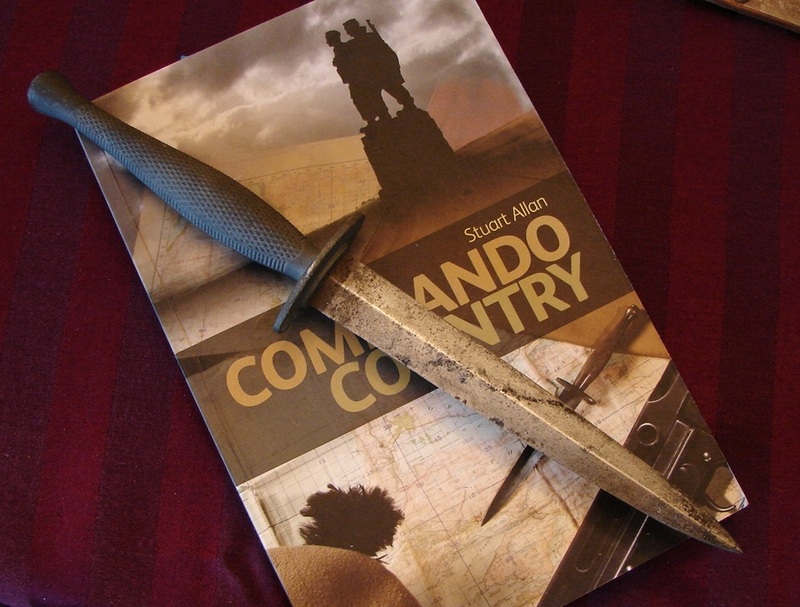 The world of the SOE and OSS agent was one entirely detached from that of the typical army trooper and therefore their weapons needs were quite different. Now many of the thumb daggers, hatpins, needles, nails etc, that are in my photos are original. (Before all I owned were copies.) Many of them are very accurate copies. While they might not look as intimidating as a Fairbairn Sykes, they were well suited for their purpose. The primary function was to create enough pain and distraction for the agent to either escape, retrieve their opponent’s weapon, or in some cases to terminate the enemy. Indeed, a few of them are capable of inflicting deadly injuries by targeting vital spots. Most of the weapons on this page are full-sized knives. Below: Here is the sales description of a knife we bought from a seller in Australia. It looks to be a fair copy of an O.S.S. Stiletto. 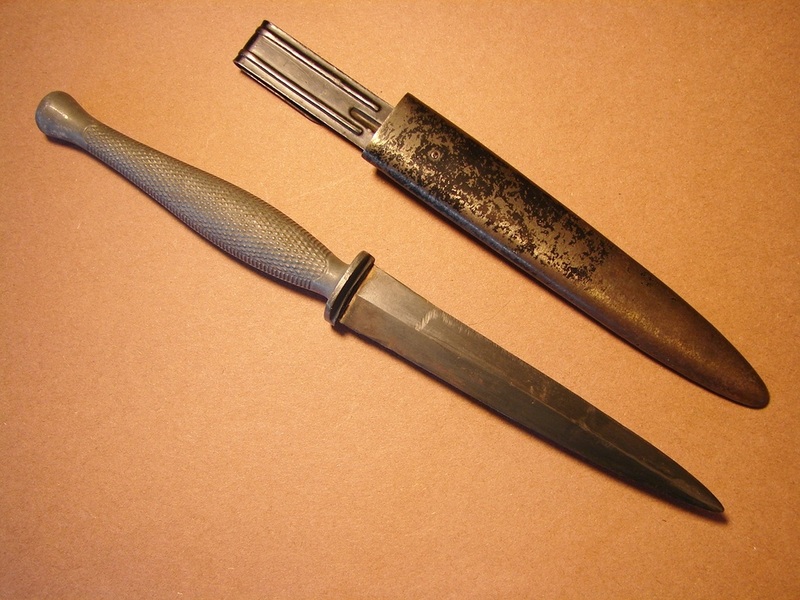 "This F-S knife was found in a batch of original WWII British and US OSS daggers. This particular knife has no markings that we can find. From investigation, we believe that they are Indian production for WWII. The blade on this dagger is blued, the handle is brass, and the tip has some damage." This attribution to India makes perfectly good sense to me knowing the clandestine work that was being performed in India and the Burma theater. Below: A visitor to our web site loaned us these photos of his immaculate OSS Stiletto. The "pancake flapper" frog for the sheath has been narrowed down to make it more practical. I don't believe you could ever find a nicer example than this one. The owner says the blade has two hardness test marks but they are very tough to photograph. Thanks Brandon for use of your photos. 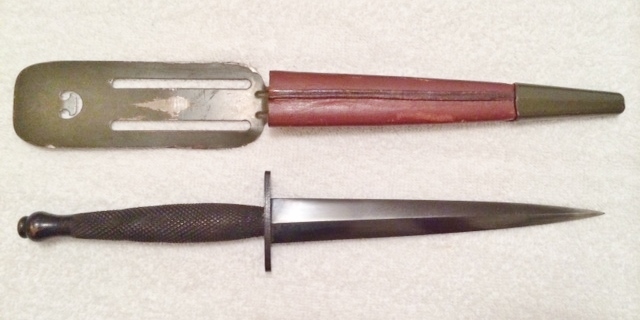 Here is an example of a rare WW-II OSS Stiletto and its equally rare M-6 sheath. 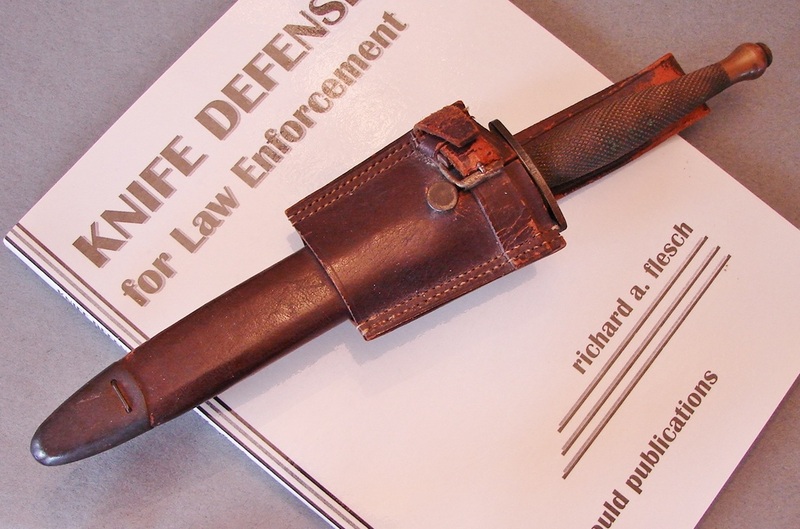 Many of these knives came with the odd-looking "pancake flapper" sheath (shown above) which is quite desirable as a collector's piece but probably not as desirable for actual field use. 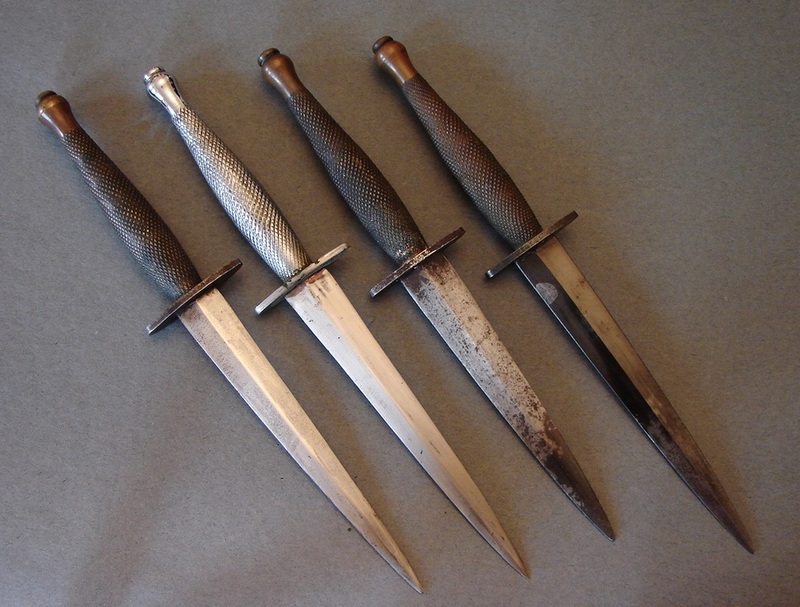 The OSS stiletto was manufactured by Landers, Frary, and Clark in New Britain, CT.
Soft blades plagued the early OSS knives and they had to be re-heat treated. Subsequently, the following batches had their hardness tested using a Brinnell tester. The instrument left a very tiny punch mark about one half inch from the guard. The OSS blades are thinner and a bit shorter than the standard F~S knife. Another way to immediately identify one is by the coarse knurling on the handle which extends all the way to the guard. The handles appear to be made from a bronze material, rather than a yellow brass. This gives them a more reddish tint. The cross guard is stamped steel nearly identical to the F~S. They are completely sterile, devoid of any markings. 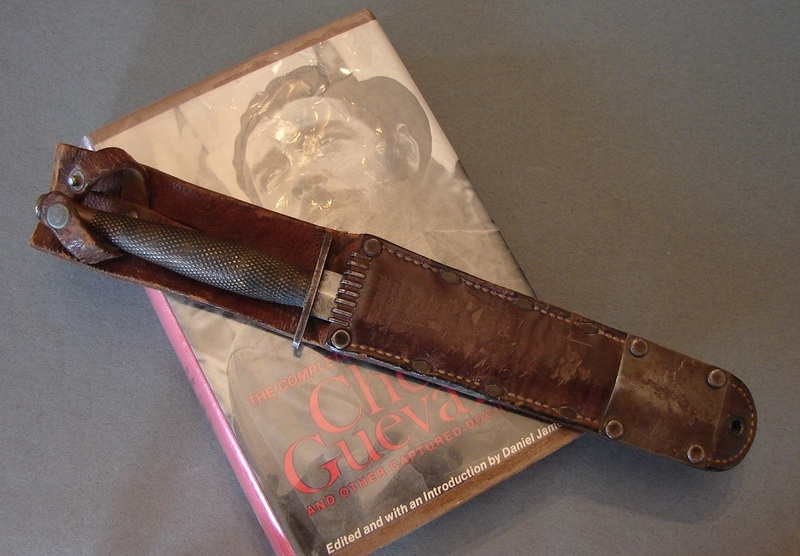 The last known issue of these knives was during the 1961 abortive "Bay of Pigs" Cuban Invasion sponsored by the CIA. Based on the sheath having been cut off, I suspect this was originally one for a V-42 stiletto or just someone removing the metal hanger used for attaching to a GI web pistol belt..
Below: The O.S.S. knife on the left had at one time been completely plated with silver, for mounting on some sort of plaque I presume. Someone cleaned the silver off the blade but left it on the handle and guard. 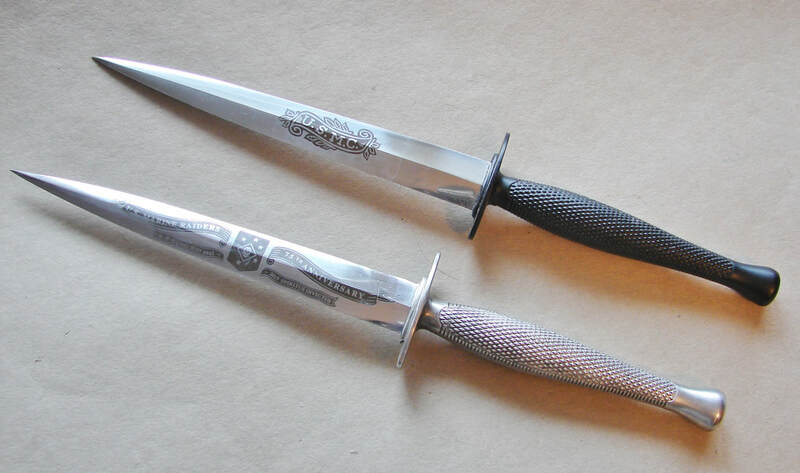 The knife on the right is nearly mint with its original blued blade and is fitted in a cut-down British bayonet sheath. Originally issued to members of the O.S.S. (Office of Strategic Services). I have seen India "I" marked FS in the same sheaths. Below: Here is a display of four O.S.S. Stiletto. Although they are called stiletto, that is misleading because correctly stated a stiletto has no cutting edge and is more needle-like in shape. In fact many of the mini-weapons issued by the S.O.E. and O.S.S. are better examples of stiletto-like weapons. Below: The handles are a red-bronze type material rather than the yellow brass of the typical F~S. Also note that the checkering runs all the way down to the guard. The M-6 sheaths are as valuable as the knives themselves. Below: Smaller, clandestine, O.S.S. thumb and lapel knives and "nails," "hatpins" etc. fulfilled other defense purposes. These weapons of last resort were often carried by S.O.E. and other special-ops agents to aid them in escaping capture. You can learn more about these on the pages for Agent's Daggers etc. More than one person has been “iced” in gangland tradition, using nothing more than a cheap, disposable, ice pick. Essentially this is what you have with the longer S.O.E. weapons. They could create small surface wounds by raking them across a person’s body, but their forte’ was stabbing to vital areas including the heart, kidneys, and the brain. The blades on most of these are from 3.5 to 5 inches long, long enough to reach most vital organs. Because of the very small handles they could be driven deeper than that. Below: Image of the superb O.S.S. 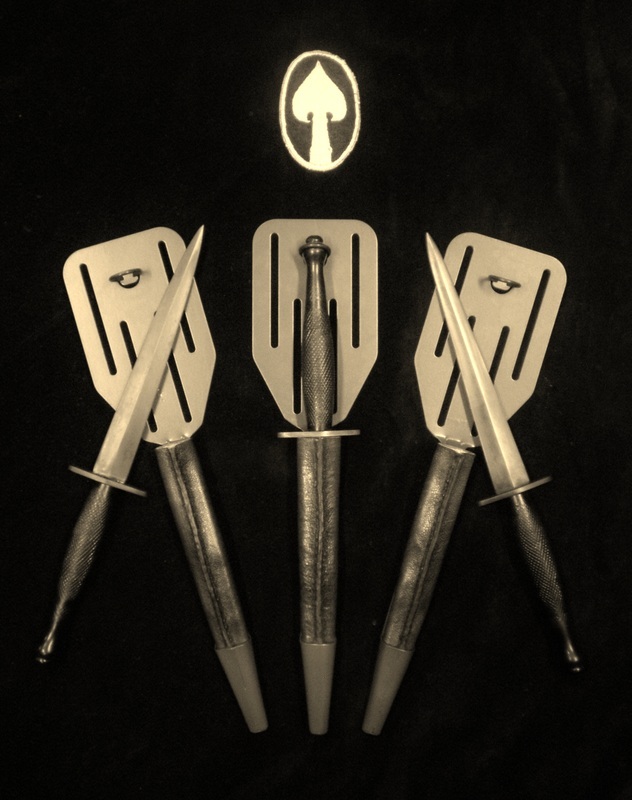 Stiletto reproductions being made by Paul MacDonald Armoury of Edinburgh, Scotland. Made in Camillus, NY by Camillus Cutlery, the Marine Corps stiletto had its proponents and detractors. Many servicemen found it to be too fragile for their common tasks. Those mundane tasks were more likely to be their daily fare as opposed to slitting throats. Not all of the men were properly trained in its use and typically preferred the more rugged and ubiquitous KaBar fighting knife over the thin bladed stiletto. The approximately seven inch blade is very similar in profile to the P-3 F~S. If you find one today that is solid, and in one piece, treat it as gently as nitroglycerin. There are a lot of cheaper version out on the market that have silly commemorative etches so be careful what you buy and know that most of the newer ones sold for very low prices. The USMC Stiletto's F~S parentage is quite obvious but its construction included a few major design and materials flaws not common to the F~S. Primary among these is the short tang and thin blade which tended to snap off, as you will note in one of the knives shown here. This wreck of a knife (Below) also had the ends of the guard broken off. The handle material is an alloy which tended to continue to age harden, making it brittle. The handle shape is excellent and cast directly onto the short tang with an integral guard, eliminating the need for a top nut and expediting production. The handle has cast-in checkering. Brass was a strategic metal so it was not used. The alloy of the P-3 F~S handles, by comparison, is soft, and remains so even today. The blades of these knives are unmarked. The knife shown here has remnants of an Olive drab green paint near the guard. Only a partial knife, the bottom one is fitted into a WW-II period metal German sheath. The branches of the guard are both missing as is a portion of the blade. There were two versions of the Stiletto issued, the US Marine Corps version with the "USMC" monogram etched into a scroll on the blade, and the unmarked Canadian version. which was darkened and without any etch. The M-6 sheath (on the O.S.S. Stiletto further above) was also commonly used for the USMC Stiletto, M-3 trench knives, and some V-42 stilettos. 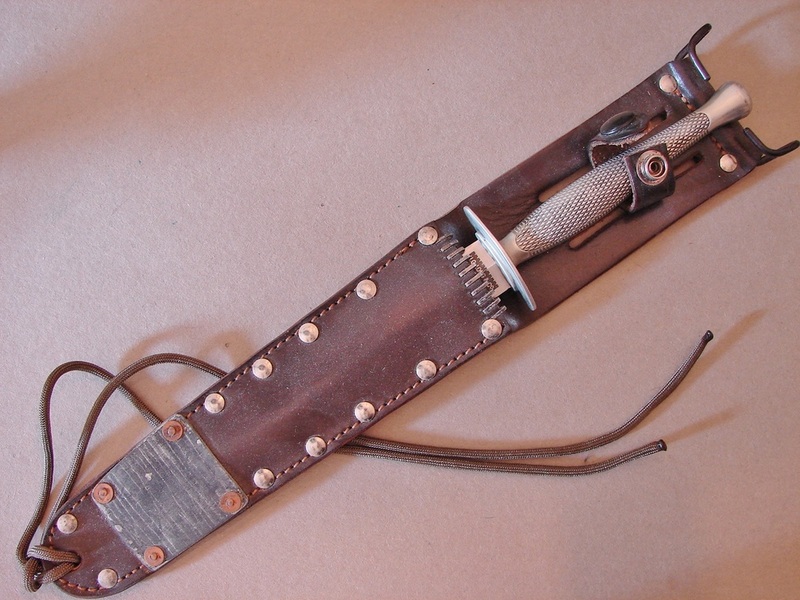 The reproduction sheath (on the right) is equipped with the GI style metal hanger allowing it to be attached to the pistol web-belt of the era. 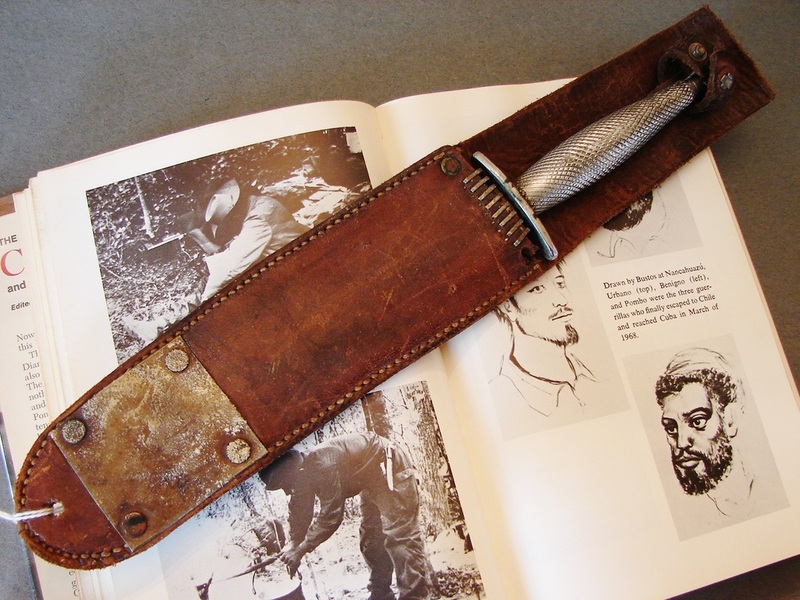 Some of the sheaths had metal reinforcing plates riveted to the bottom to prevent the blade from piercing the sheath, and some also had metal staples at the throat to prevent the blade from cutting it during insertion. Today the M-6 sheaths are almost as valuable as the knives they housed. 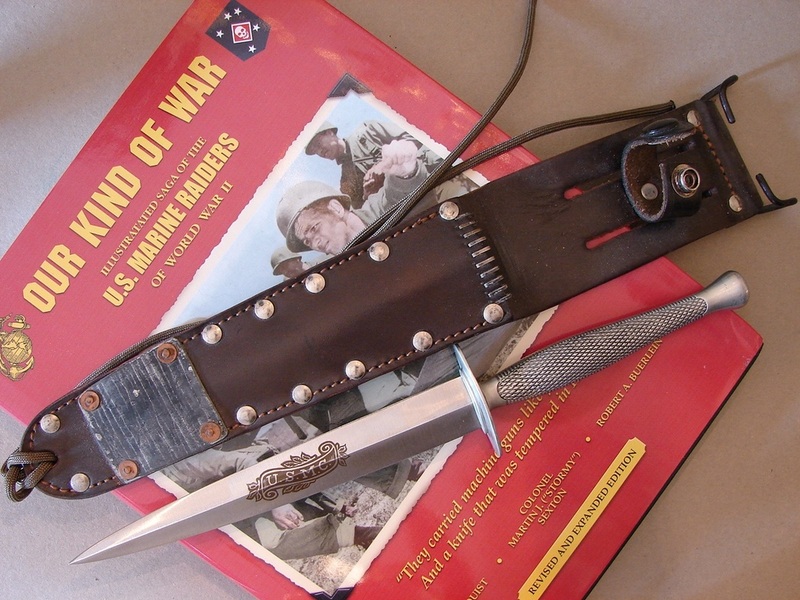 Right: A fine reproduction of the WW-II USMC Raider Stiletto. This copy was made by HG Long of England. 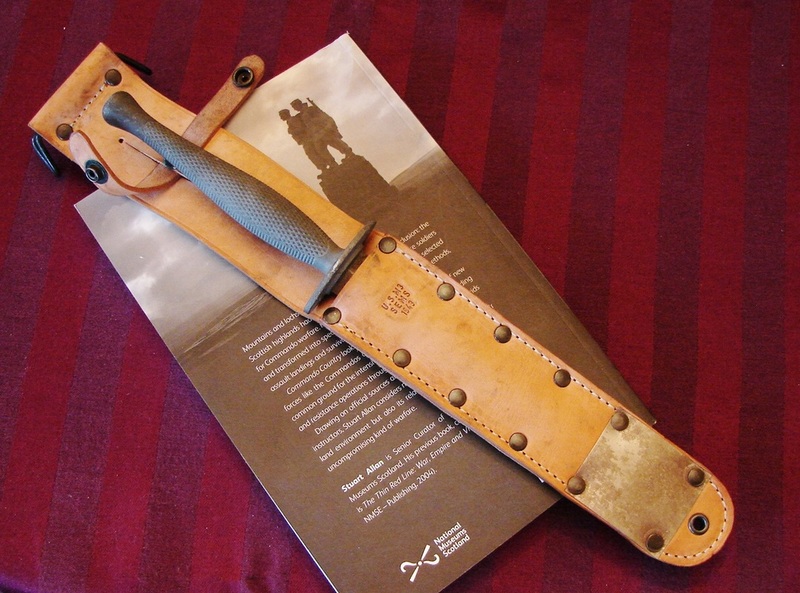 It came in a high quality reproduction sheath that closely duplicates the original. The blade has a beautiful "USMC" scroll etch like the originals. Below: The HG Long etch is very crisp and artistic. This is a knife any soldier would be proud to carry. However, like the originals, the thin blade makes it a very delicate instrument. 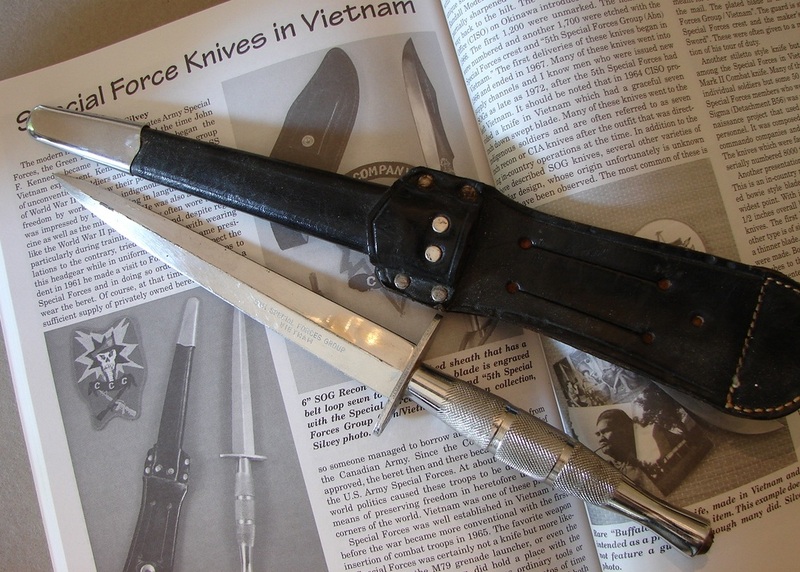 Below: This is a relatively rare American 5th Special Forces Stiletto from the Vietnam War era. 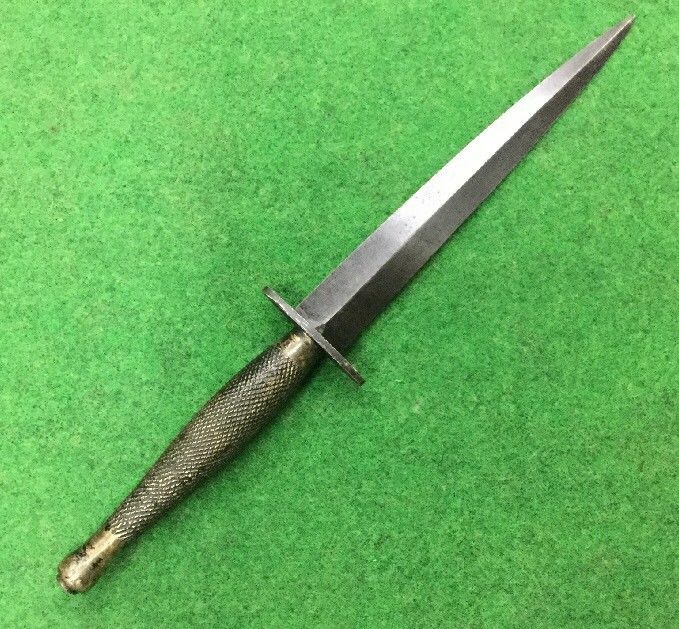 The knives were given to the troops after a tour "in-country," It is a very well built knife whose only drawback is the nickle or chrome plating on the blade. The sheath is unique and well made as well. The best knives were manufactured by Japan Sword Co. Seki, Japan. There are several variations of this knife. The best ones, like this one, were made by Japan Sword Company. There are other versions that were made in Thailand and Okinawa, I believe. The knives were generally issued to the soldiers on their return from Vietnam. Some of the other version have the 5th SF crest soldered onto the handle, the handle on those knives is also shorter and less graceful. It is not uncommon for the chrome plating to be peeling from either the blades or handles of these knives. The sheath is rather unique in shape and well made. The Japan Sword knives came with a high quality sheath and the others came with relatively poor quality sheaths, or sometimes even without a sheath, just a cheap presentation case. 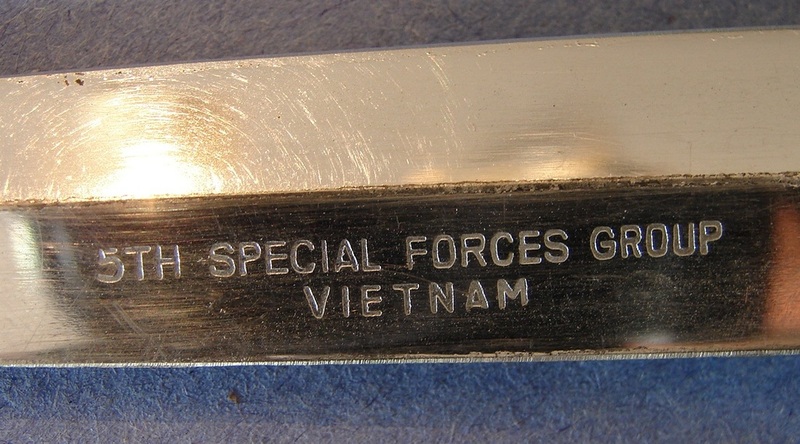 Below: A cose-up of the Special Forces blade etch.